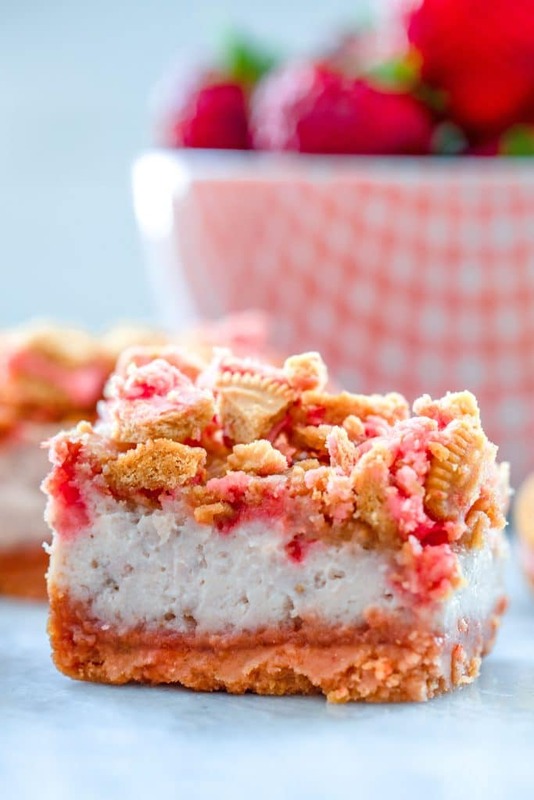 These Strawberry Shortcake Cheesecake Bars are a delicious summer dessert perfect for BBQs or summer parties. 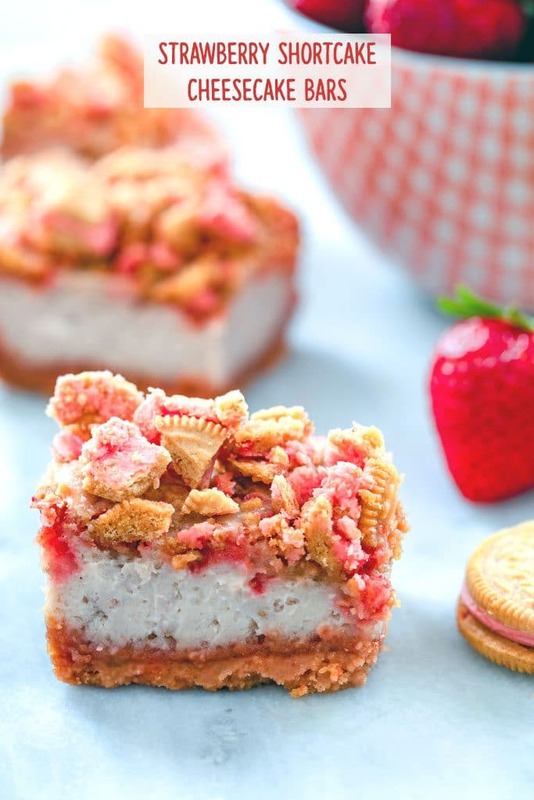 They’re packed with fresh strawberries and have a Strawberry Shortcake Oreo crust and crumble on top. OK, I will be the first to admit that Oreo is getting a little out of control with the amount of new flavors they’re dishing out lately. But I’ll also be the first to the admit that I’ve been buying every single one. Because each sounds even more delicious than the last and I just cannot resist at least trying them. And when I realized Strawberry Shortcake Oreo Cookies were a thing, I bought four packages. Yes, four. Because they’re based off those Good Humor strawberry shortcake ice cream bars, which are pretty much my favorite thing ever. And that’s coming from someone who would almost never choose ice cream with fruit over chocolate, peanut butter, etc. I’m happy to report back to my faithful readers that these Oreo Cookies taste exactly like the ice cream bars and I’m pretty sure they just made their way up to my #1 most favorite Oreo flavor ever. Cue the parades and celebration. These babies are freaking delicious. Since I had four packages of them just sitting in my cabinet, I knew I better make some sort of dessert with them and decided cheesecake bars would be just the thing. 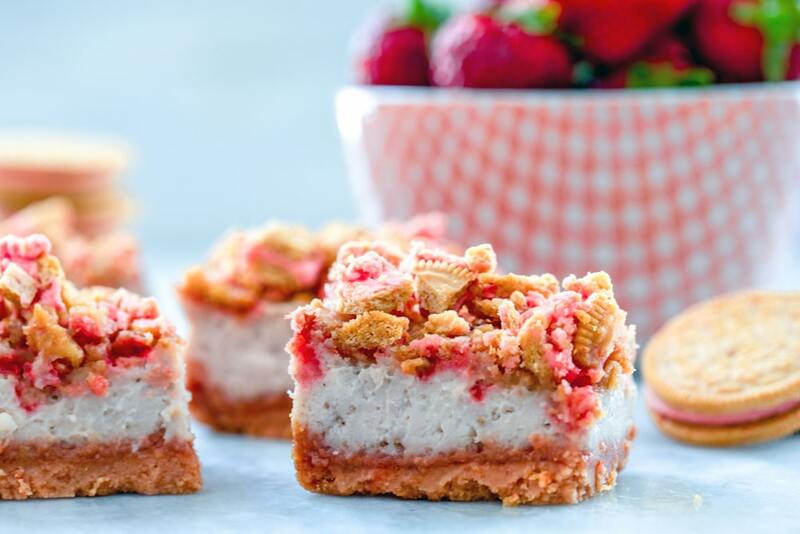 I had to do a little testing with these bars, but landed on these delicious strawberry shortcake cheesecake bars that are packed with both strawberry and cookie flavor. I’m in love and about to start a petition urging Oreo to never discontinue this flavor. I can only stockpile so many packages in my house. These bars are a great summer treat and are perfect for bringing to summer BBQs or parties. Or making at home on a rainy Sunday because you’re craving something sweet and the Oreos are burning a hole in your pantry. If you can’t find Strawberry Shortcake Oreo Cookies (or God forbid, they actually do discontinue them wahhh), you can use the Golden variety, but just won’t have as much strawberry flavor in the crust and crumble. 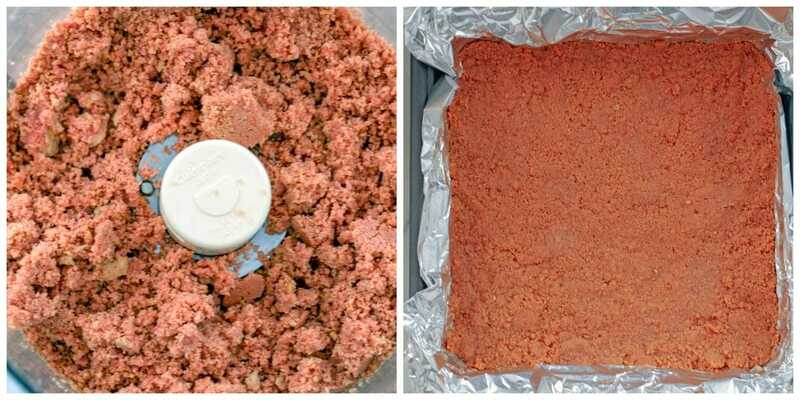 If you want all that strawberry flavor, try crumbling up freeze dried strawberries and mixing them with the crumbled Golden Oreo Cookies for the crust and the crumble. You’ll start by making the crust, which is simply Strawberry Shortcake Oreo Cookies and butter. Then comes the filling. It’s a pretty basic cheesecake filling with strawberry puree added in, plus some flour for a bit of stabilization. I almost just ate that strawberry puree with a spoon because, for whatever reason, it tasted even more delicious than whole fresh strawberries! Once the filling is poured over the crust and you top the whole thing off with more crumbled Oreo, bake until the filling is just set and then let the cheesecake cool. It will also need to sit in the fridge for a few hours before you can serve it. I know… It’s pure torture waiting. I recommend baking this before bed, so you can pop it in the fridge and go to bed with very sweet dreams of your morning treat. I meannn, you could kind of pull this off as a breakfast bar, right?? A strawberry shortcake cheesecake BREAKFAST bar. I’m in. Not that I’m recommending you start your day with this kind of sugar rush. I’m also not recommending you feed these to your dog, but I have to let you know that my pup stole TWO of these bars (the two large ones in front of this photo) plus ONE Oreo Cookie, while I had my back turned doing dishes. Um, excuse me?? I couldn’t be too mad because she was clearly in serious heaven after eating these. Also, she didn’t get sick. And? Her breath smelled amazing for the rest of the night. So, dog-approved, I guess? Most of you might say, “pshh who cares? ?” but my dog is super picky, so I’m giving myself points for the fact she ate two and would probably have finished them off if she could reach the others. 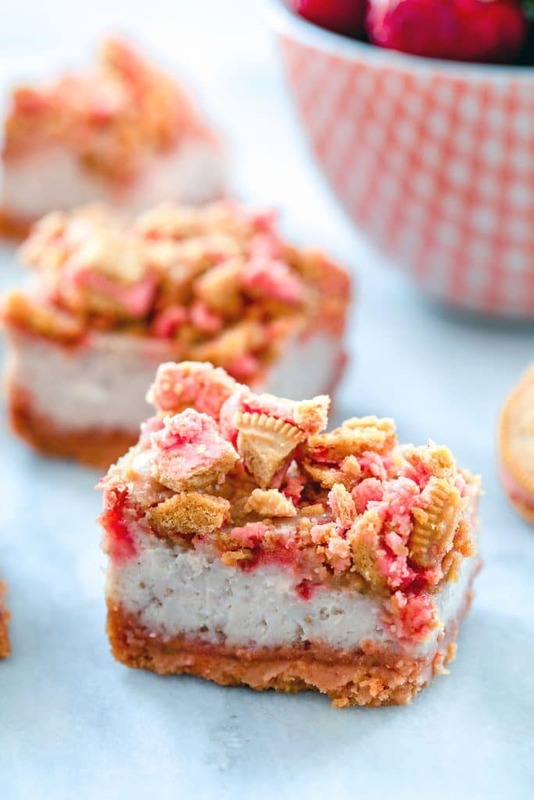 But seriously, friends, these strawberry shortcake cheesecake bars taste a whole lot like the ice cream treat. Which made me really, really happy. My husband got the bright idea to put these in the freezer (he tends to do this with all my cheesecake and dessert bar treats) and with that, they were even more ice cream-y. They’re also pretty rich and satisfying, which means you’ll likely feel totally happy after one (unless you’re my dog). Of course, you can cut them into smaller bars if you want. I kept them pretty large for 16 total bars. In some ways, it feels like summer is rapidly coming to an end… But really, there’s still plenty of time left. I am horrified for any teachers or students who have to go back to school in July. That sounds like pure torture. Growing up, I never went back to school before Labor Day, so even August seems just wrong to me. Not that it really matters anymore since most of us are just plain working and don’t get summers off. Sooo, in that case, let’s all live in summer mode until it’s officially over in mid-September. Who’s with me?? What’s your all-time favorite Oreo flavor?? If you’re looking for more fabulous summer bar recipes, check out these Lemon Cookie Dough Bars or these Sweet Tea Vodka Cupcakes! These Strawberry Shortcake Cheesecake Bars are a delicious summer dessert perfect for BBQs or summer parties. They're packed with fresh strawberries and have a Strawberry Shortcake Oreo crust and crumble on top! Pre-heat oven to 325 degrees and line an 8-inch square baking pan with aluminum foil so foil is overhanging on two sides. Lightly coat with cooking spray. Put Oreo Cookies in a food processor and blend until they turn into crumbs. Pour in melted butter and pulse a few times until well blended. Put cookie mixture into baking pan and press down into even layer on bottom of pan. Bake for 10 minutes and then remove from oven. Keep oven heated at 325 degrees. 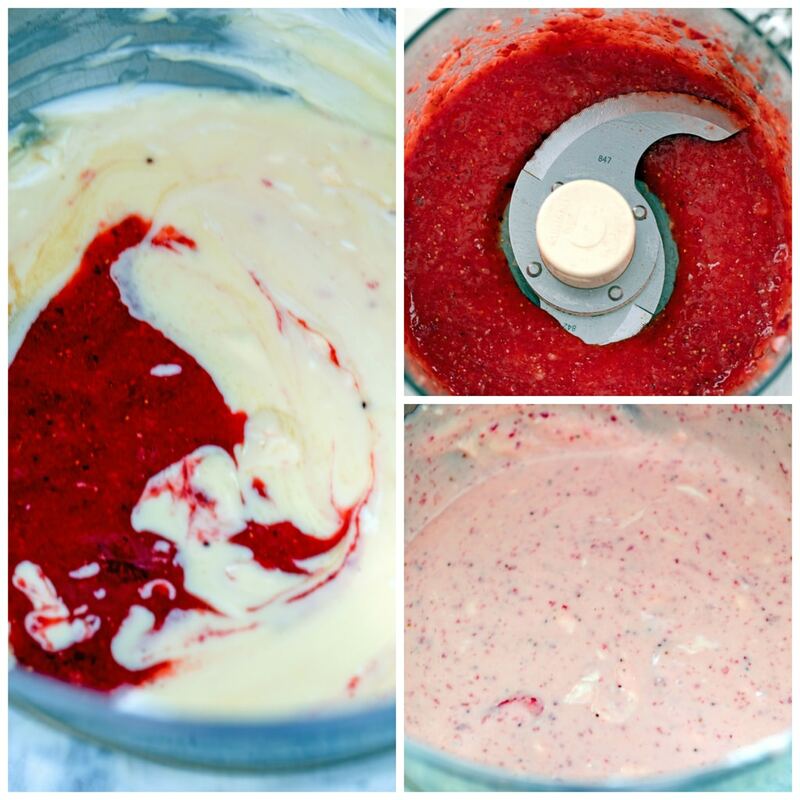 Place strawberries in a blender or food processor and process until strawberries are pureed. You should have about 3/4 cup of strawberry puree (it's OK if it's a little bit less). In the bowl of a stand mixer fitted with paddle attachment or in a large bowl with a hand mixer, beat cream cheese on medium speed for about 1 minute, until fluffy. Add sugar, flour, salt and vanilla and beat until mixture is smooth. Add eggs, one at a time, beating after each addition until smooth. Mix in strawberry puree. Pour batter over crust. Crumble about 8 Strawberry Shortcake Oreo Cookies and sprinkle them over the top of the cheesecake filling. Bake for about 35-40 minutes at 325 degrees, until edges are turning golden and filling is set, but still a little jiggly in the middle. Remove pan from oven and let cool completely before placing in fridge for at least two hours. Use foil overhang to take bars out of pan. Remove foil from bottom and set on cutting board. Crumble remaining four Oreo Cookies and top cheesecake with them before slicing into squares and serving. Note that you will need two packages of Strawberry Shortcake Oreo Cookies for this recipe. 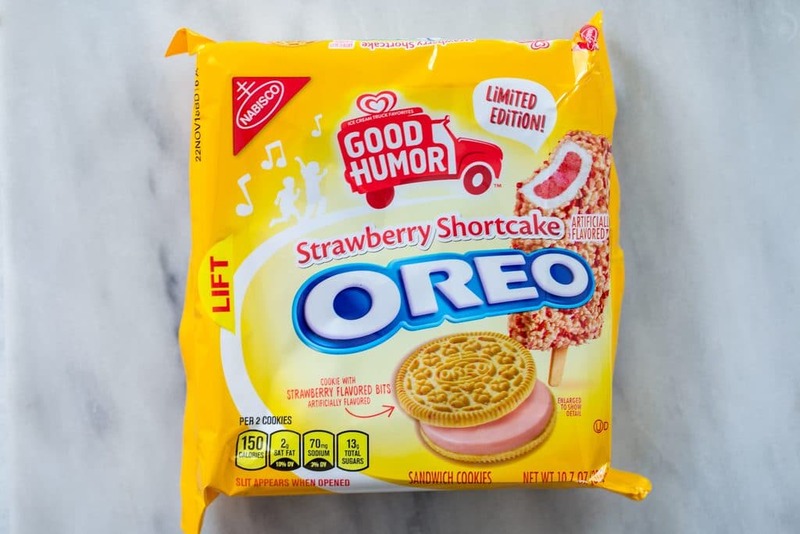 If you can't find Strawberry Shortcake Oreo Cookies, you can use Golden Oreo Cookies and add in crushed freeze-dried strawberries for the strawberry flavor. 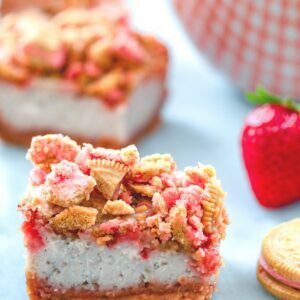 12 Responses to "Strawberry Shortcake Cheesecake Bars"
I can not even believe that Oreo made a strawberry shortcake Oreo! They were my favorite growing up too! Love that you have made these cheesecake bars out of them well! Inspirational! What a fantastic use for these summer Oreos! I can’t wait to try your recipe. It looks delicious!! Looks so fabulous! This recipe reminds me of one of my favorite ice cream bars as a kid. “Kind of a breakfast bar”… good one. These are soooo good! Tastes just like the Good Humor bars in cheesecake form! Such a creative dessert — I’ll have to be on the lookout for those oreos! You did an amazing job using those Oreos. I am sure the kids love these bars. The list of variations is a bit crazy, I agree, but what a fun way to use the strawberry shortcake version! Love the strawberry filling. The variations sound nutty, until I buy each one and LOVE it. I was psyched for these and they did not disappoint. I judged the pistachio and the pina colada but loved each. Do you know if 1 pack of these oreos is enough for the entire recipe? The special flavors tend to have the smaller packages and I only have 1 of these in the pantry. @Michelle- I was actually meaning to update the recipe to include this info! Unfortunately, the packages are smaller than normal and close to a full one is used for the crust, so you wouldn’t have enough for the topping. However, you could probably remove a few from the crust and while it would be a bit thinner, it should still be fine! If you have any of the Golden cookies, those would work well in combination, too!